The Club has received a letter of thanks from the Team Help for Heros for a donation given to it. You may know that the Club allows serving troops admission free but if they wish a season ticket, a donation of £25 is "sought" from each applicant and in turn, the Club will supply the ticket but pass on the donation to Help for Heroes. You may not know this but the Club has been doing this scheme for the past 6 years and has helped to raise a substantial amount for this deserving charity. If any other serving troops would like a season ticket, this is where your money goes. 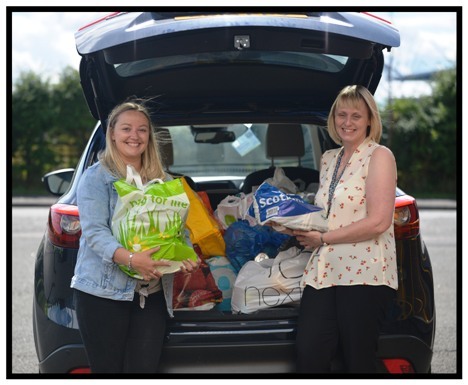 On Saturday, 4th August, the East Fife Supporters, Players and Club responded magnificently to an appeal to replenish the local foodbank. Isla English was overwhelmed and was extremely grateful for the amount of donations. When our players' Captain, Kevin Smith, heard about the appeal, he immediately went to his players and raised a significant amount of cash to buy goods. The Club matched this amount and , of course, both sets of supporters really outshone themselves with their donations. 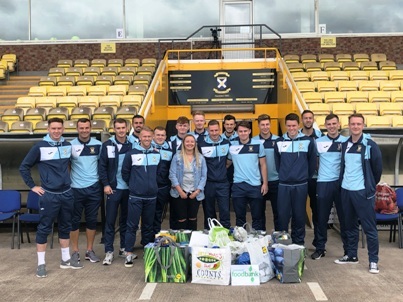 The photos show the amount collected by the Players before the match and a car being fully loaded (this was the first load and another full car took up the remainder). It’s the first league game of the new season tomorrow as East Fife welcome Dumbarton to the Locality Hub Bayview Stadium. The Methil men can be reasonably satisfied with their performances in the Betfred League Cup, although will feel that the points total accumulated across the four games did not accurately reflect their efforts on the park. Manager Darren Young added to his squad during the week with the acquisition of young striker Rory Currie in a loan deal with Heart of Midlothian until January next year. Visitors Dumbarton had a similarly challenging Betfred group, winning against Queen’s Park, drawing with Spartans and losing out to Premiership outfits Kilmarnock and St Mirren. Sons boss Steve Aitken will be hoping for a quick return to the Championship after losing out by the narrowest of margins to Alloa Athletic after extra-time in the play-offs final in May. There are several ex-Dumbarton men in the East Fife ranks, including Mark Docherty, Scott Linton, Scott Agnew and Kevin Smith, while new Sons of the Rock signing Bobby Barr turned out for the Fifers in 2012-13. The last meeting of the sides was two years ago when East Fife emerged 2-0 winners in the Betfred Cup at the then named Cheaper Insurance Direct Stadium. Kevin Smith and Paul McManus were the goalscorers in an impressive performance in sweltering conditions. Mark Docherty, Scott Linton and Craig McDowall look set to miss out once again through injury for the Fifers, with new signing Rory Currie added to the squad that went down narrowly to Falkirk last Saturday. Supporters of both clubs are reminded that they are welcome to enjoy refreshments at the stadium bars before and after the game. The Jeek Flaming Suite and Jimmy’s Bar will be open to both sets of supporters from 12.30 pm.